From the moment you step on our lot until the time you drive away in your next car, your buying experience with Mathis Auto Sales is our number one priority. We encourage you to use the expertise and resources of our sales staff; they are here to help you find the right car at the right price. Call us today at 803-652-2736 to schedule your test drive! Locally owned and operated since 2004. 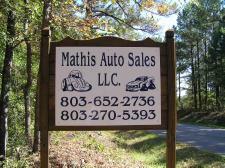 Here at Mathis Auto Sales LLC I have been selling vehicles since 2004. I consider the business a hobby, even though I have been a licenses dealer since 2008. I keep an inventory of 25-35 vehicles most of the time, specializing in small cars, sedans, with some SUVs and trucks. I have a full time job “that pays the bills”. Praise God for a good job. I hope to continue the business after I retire, but I had to get “Grandfathered-in” on a Zoning issue for our area, so I needed to move forward with the business licenses in 2008. Yes, I am Selling Cars In The Woods. Some people think maybe I have bumped my head, but we have had over 300 vehicles leave these woods and I Give God All The Glory! James 1:19-20 On lot financing available. Call for details. I provide a 3 month/3,000 mile written warranty with most vehicles at the listed price. I may not be able to provide this warranty on some vehicles due to warranty conditions.